How does a word become obsolete? Is it simply that dialects morph over time or do we drop a word in favor of others that roll from the tongue with more grace? I recall a story on NPR when “slacks” was being voted out of the language. I must admit that I wouldn’t be sad to see it go. Pants, trousers, jeans, khakis, capris all hit the mark with greater specificity or at least a more amenable sound. Slacks clamors for attention like an ugly tattoo on an aging beer belly. I recently became aware of the Scribbler, a (former?) blogger with a knack for finding words that have fallen from the English language. I was captivated by groak. To Groak is to silently watch someone while they are eating, hoping to be invited to join them. Though my investigations revealed little to nothing about the word, the only other place where I find a reference is a Scottish dictionary. From C. M. Maclean Farewell to Tharrus: She groaked a little and tried to lick my chin. “Where’s Laddie?” I whispered to her. She whined and ran off. When does one groak? The envious mongrel eyeing the greasy mutton on his master’s table? The 5th grader with his daily peanut butter rations looking longingly at the hot-lunch purchase of his peers? A writer, struggling to find her inner farm girl, ogling the poster for an Urban Farm Tour to be held exactly on the day that she’s visiting Atlanta but outside of her action-packed agenda? Yes. I am here to groak over the Metro Atlanta Tour de Farm. Today and tomorrow is the second annual bicycle tour of Atlanta urban farms which includes chef prepared meals and overnight camping trip at a local farm. Proceeds from the event will benefit Community Farmers Markets and the participating sites. Somewhere along the way, participants may be fortunate enough to indulge in a Georgia peach cobbler. That will leave the groaking up to the rest of us. Preheat the oven to 350 degrees. Peel and slice peaches. Place into a 9 x 13 glass dish. If peaches aren’t completely ripe, place in a boiler, cover with water and bring to a boil. Once the water boils remove from heat and rinse under cold water. Cover the peaches with the lemon juice and stir completely. In a separate bowl mix the sugar, flour and baking powder. Add the eggs and continue mixing all ingredients with a fork. The mixture will be dry and lumpy but continue mixing for several minutes until crumbly. Sprinkle the mixture over the peaches. Drizzle the melted butter over the cobbler. In a small bowl mix together one part brown sugar and one part cinnamon. Sprinkle the mixture over the cobbler. Bake for 30 to 45 minutes or until the crust is golden brown. The sauce will thicken as the cobbler cools. I didn’t know slacks had left the language. Pants is a fine word, but with the advent of the pants suit, whose name got squashed into pantsuit, catalogs now refer to “a lovely silk pant with matching jacket.” That is just wrong. No one seems to remember pants or pants suits. As for groaking, I do it all too well. I’m doing it now, long-distance, at the recipe for peach jam cobbler. pant? really? like a dog out of breath? I need to pay closer attention. haha! It’s a great idea for an event to create though. Hi Tammy, Aunt Sally sent this my way! 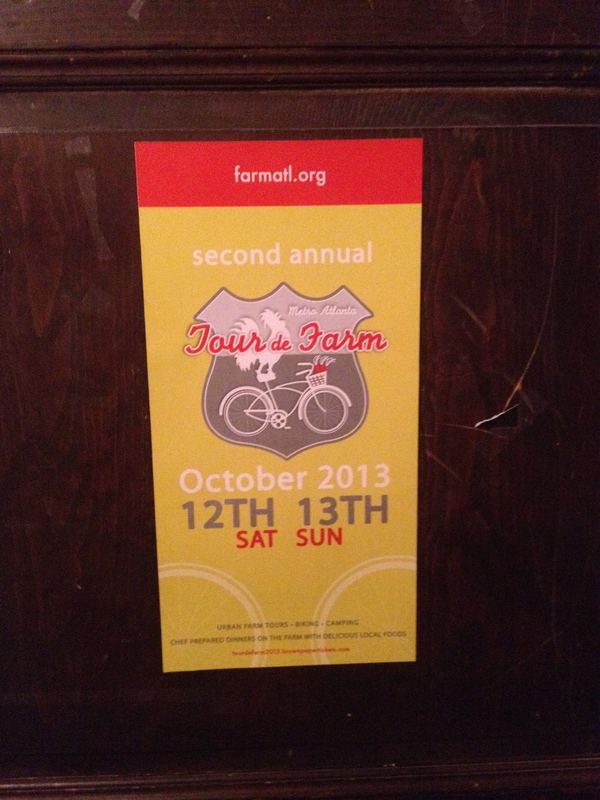 I’ve been traveling so much I didn’t even know about the Tour de Farm. Too bad, and more so that you are in Atlanta–and I’m not right now!! I am back up in Tennessee this weekend and cannot ride with you! However, I will sure take time to visit some of the farms you’ve mentioned in your blog when I return back home to Atlanta in a few weeks (unless Congress never reopens the government!) Meanwhile, enjoy the peach cobbler, Southern hospitality, and, if you have any spare time, visit the Atlanta Botanical Gardens!! Love to you and Yours! Would have loved to see the gardens but alas, would be groaking at that also. We’ve been really busy this weekend with CNN, cyclorama, silver skillet, world of Coke, cabbagetown and cemeteries. Great post. It inspires me on a number of fronts, and, no putting slacks on isn’t one of them. As an avid cyclist and foodie in love with local fare, I’m inspired to whether we could bring such a tour to our local CSA farmers here in the Ottawa Valley. It’s a great idea. I’m also inspired to see if I can find the last of the peaches in the city to try this cobbler. Sounds yummy. Thanks for sharing a great post. I think the idea of the event is superb. I think it would be too far in between farms where I live but maybe a nice garden tour? You’ve inspired me to add a new word to my vocabulary! I pledge to use “groak” at least 5 times this weekend, starting with a trip to the farmers’ market. It is a good word, isn’t it Mary? I will find a use as well. I think you should if it fits the purpose. I love learning about this Farm-Bike tour and would love to introduce this idea to Nashville. We have a growing cycling community. I hope you have enough urban farms close enough together to make it work. It would be a struggle for us at this point but so wish I was free to do this today. I have never heard the word groak, but it totally fits its meaning! Every once in a while I hear a word that hasn’t been used in ages, but alas, I can never remember it later when I would like to use it again. The bicycle tour sounds awesome! I especially enjoy the names of the farms. The peach cobbler will be wonderful when our peaches come in season (I’m thinking soon…). Thank you for sharing! The recipe looks really sweet but apparently it is award winning. Enjoy. Wait, what?! Slacks is out? That makes me feel a bit old 😦 Now, Groak…don’t think I’ve ever heard of and definitely have never used. I think I’d going to try and throw that around a few times. Haha. I’m always so jealous of the events you attend. I’ll have to see if there is something like this near me. It just sound so awesome. Lucky you!! I am also going to try groak on as a regular word! I didn’t actually get to attend the event – simply groaking over it. If you don’t have one, you could start it! I love the idea of this event too, Tammy! And the recipe sounds delish. Hope your stay in Atlanta is still great, even without doing the tour! We had a great time Deb and I’m sure I would’ve liked the tour more than my son! The recipe sounds like a winner. In my new community I am beginning to watch them plant produce and I hear that there is a lovely event put on that benefits the local FFA. While it doesn’t include the bike tour it does feature local produce in a meal to die for. Can’t wait to make the recipe or for the Yuma Harvest…. I’ll be down for harvest dinner this year! That sounds delicious, I’ll have to try making some next year! Egalntine? I am looking forward to it because it isn’t something I’ve ever heard of before. Groak. Priceless; clever Scribbler! I wonder if the word has does out because these days there is not the need to groak so much. Things have edged towards a greater measure of equality and in Britain, you don’t get the people hungry on streets like you did in yesteryear. Elsewhere I have no doubt, and am sad to admit, that groaking still carries on. Perhaps you’re right Kate and wouldn’t it be grand if we lost the word because the action no longer occurred? For some odd reason, I too have found word research interesting. I’ve used this long forgotten word before but I always termed it with the look of a dog sitting under the table. Nowadays I suppose ‘droolish’ could be used although its a neologism with a easily understood meaning. I know, it’s reaching but it’s fun to use them and create your own. A sentence I will always remember I came up with in my first novel as a descriptive ‘telling’ about the lack of insect noises in the darkness of a prehistoric jungle island where there should have been thousands of sounds. “Twain shivered as he listened to the change. Insectual silence overran the camp. The editor squashed ‘insectual’ like a bug. ‘Groak’ and many more can be found in the Kindle book, ‘The Most Remarkable English Words Ever Forgotten’. I’ve used the book before when needing that one word that drives interest in understanding what it really means when I didn’t have one. Here’s a handful from the book with their elusive meanings. Makes for great writing. Note: I’ve used ‘jirble’ before when I wrote about a person bringing me a draft and the glass was half full because his hand shakes all the time. Beef-witted: Having an inactive brain, thought to be from eating too much beef. Queerplungers: Cheats who throw themselves into the water in order that they may be taken up by their accomplices, who carry them to one of the houses appointed by the Humane Society for the recovery of drowned persons, where they are rewarded by the society with a guinea each, and the supposed drowned person, pretending he was driven to that extremity by great necessity, is also frequently sent away with a contribution in his pocket. The WiseGuy: A stylishly handsome man of great creativity who loves to write as does the AGRIgirl and whose work can be read at TheWiseGuyDiaries.com. Never hurts for one to get in a free ‘plug’ when they can. “Oh, stop it! I know, so there might be some typos, and by the way, ‘Pant’ is acceptable as is ‘Trouser’ yet most use them in the plural form. Quite the list Bill! I think the word that intrigues me most is Tyromancy: Divining by the coagulation of cheese – I may have to do some googling on that one. I like them too Tandy – even if my memory doesn’t allow me to recall them for use. I’ve heard of “grok” but not “groaK” and the spell checker really really wants to autocorrect to groan. My spouse adopted 2 elderly wiener dogs so there’s a lot of groaking going on around here. Yes, that spellchecker was quite the challenge with this post. I have the good fortune of having children who had excellent teachers and they are excellent grammarians – correcting me frequently! I groak too, Tammy. On our island of narrow, winding, hilly roads with no shoulders, we’d have to ban all automobile traffic for a day to have a safe Cycling Farm Tour. Let’s see…four oxygen bearing ambulances, livestock to pull bicycles uphill, smelling salts, tents and cots for naps. But wouldn’t that be fun to have a no-traffic day? In German, there are many words belonging to certain dialects that aren’t known outside their regional origin. For example, there is the northern German word “krüsch” which means being very selective with what you eat (like “picky” in English, but there’s no other German word that corresponds to pickiness in the context of food, so you’d have to specify the area of pickiness when you say someone is picky, which you don’t have when you say someone is krüsch, however nobody will understand what you mean if you say that elsewhere than in northern Germany 😀 ). Just watched the Amy Webb Ted Talk about being picky. Now, if I go back to Germany, I’ll have a word for it. Seems like you could have a fun tour like that in your area Sheree. Been awhile since I’ve been on a bike tour. Sounds like fun. “Groak” reminded me immediately of “grock,” the term used by Michael Valentine in Stranger In A Strange Land. It was a Martian term that implied an all-encompassing understanding. I get it, I believe it, I understand it, I know it, and finally I grock it. When you mentioned a Scottish connection for “groak” I was reminded of groats, a term (Celtic maybe – Scotland and Ireland) used for crushed oats. The bike farm tour sounds like a blast! Glad you got to ATL after their annual heat and humidity festival were finished. By the way, you might enjoy browsing this site too: http://phrontistery.info/ihlstart.html I can get lost in there for hours, like some might in casinos or bars. and groak is not there! Thanks Nancy. I never envisioned needing a chemical to adhere color to liquid! scary, isn’t it? That sounds great. Definitely groakworthy. Hmm, I probably had a few Groak moments when I thought someone I knew was eating something delicious. Sometimes I get lucky and did get to be invited. Yummy recipe my friend. Best wishes to you and your family. Groak is a good word. These days I find myself most interested in talking with the people rather than eating their food although food always leads to terrific conversation. I think the tour sounds like a brilliant idea – very inventive and fun all at the same time. I’d love to hear more forgotten words, groak is so onomatopoeic isn’t it. I’ve found that forgotten words are the passion of a few bloggers in this process. Yes, it is. I haven’t used it in ages although I will try to do so today.